1. Nomaterra Cape Cod Wild Beach Rose - Nomaterra is a relatively new brand based out of NYC and I loved the story behind this niche brand. Each scent is reminiscent of a certain destination - bringing to light the idea that fragrances can transport you to different places or help you revisit certain memories associated with a city or town you enjoyed. This particular scent would best be described as beachy rose. It mixes the delicateness of rose with the notes of the beach which is something I don't have in my current collection. I find it so unique because most florals can seem sweet or powdery, but this has an unexpected woodsy freshness. In my mind, I envision a rose garden on the side of a new england beach home when I smell this - which basically sounds like paradise, doesn't it?! 2. Aerin Lilac Path - My love for Aerin fragrances keeping growing and growing (this fragrance by Aerin is one of my best of beauty). Between the gorgeous packaging and the wearability of all the scents I can't get enough. It always amazes me how she can create SO many unique scents but yet all of them appeal to me in different ways. 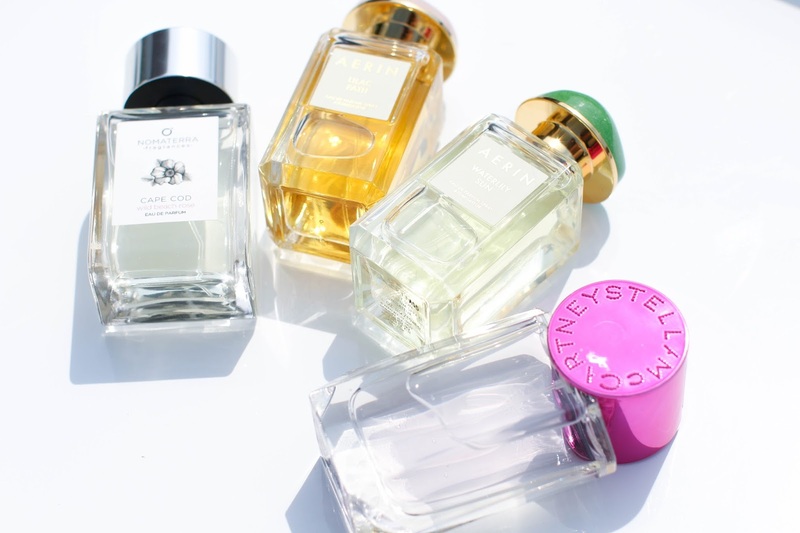 While the notes are prominent and the fragrances last all day, they are still such easy scents to wear. They never turn on my skin and it's shocking how every single one I try manages to work with my body chemistry. This particular one has notes in it that I'm not typically drawn to (Jasmine and Lilac), BUT they are mixed with other notes (Orange Flower, Angelica Seed Oil) that drew me to it instantly. It's a warm floral that allows for it to be a great daytime scent for the summer, though I can see it transitioning nicely into fall. 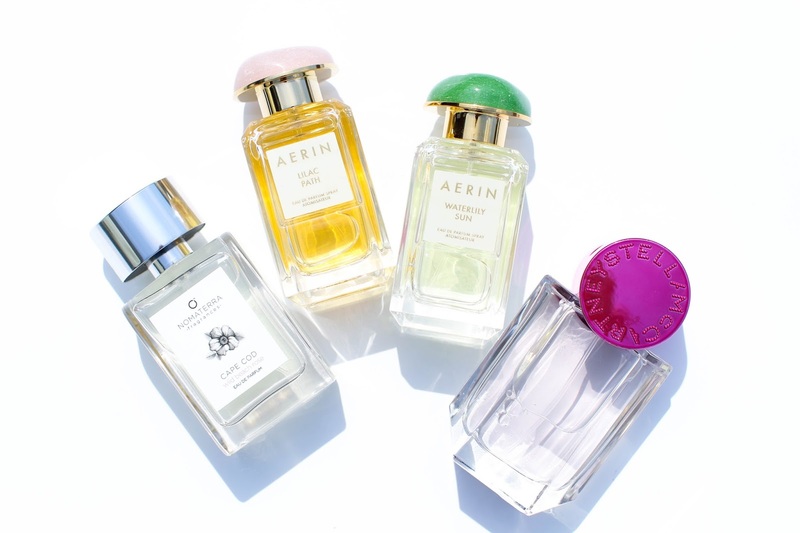 That is what I love about Aerin's fragrances - she uses notes that I never enjoy or wear and then creates blends that I end up going crazy for! 3. Aerin Waterlily Sun - Another Aerin fragrance addition, but completely different from the Lilac Path mentioned above. The Waterlily Sun is more herbaceous, fresh and crisp with notes of Bergamot and Jasmine. It reminds me of the water, so I see this as more of a spring/summer scent. It wears very well on my skin and develops nicely even when it's hot outside. I've been reaching for it when I have bare shoulders, arms or legs because I love the way it smells as the day goes on. 4. 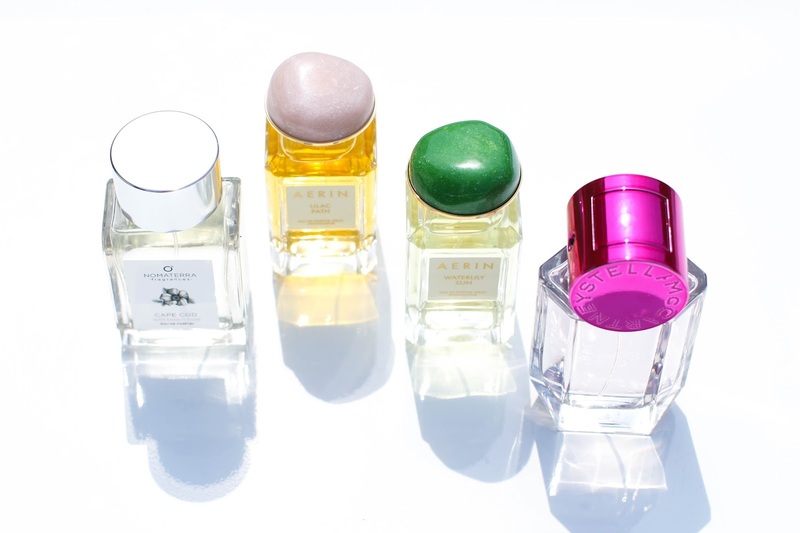 Stella McCartney Pop - I was anxious to try Stella McCartney's newest scent because I have been a LONG time wearer of her signature scent. When I say long, I am talking at least 10 years if not more. By the name alone, Pop, I anticipated this being a younger, sweeter fragrance and those can often be a hit or miss with me. While it definitely has a floral lightness to it (green mandarin, violet, plumeria), the woodsy elements such as sandalwood and cedarwood give it a deeper, more sophisticated finish. Bottom line - I am crazy for this scent!